It looks like we’re closer than ever to the official reveal of the disc-less Xbox One. The Xbox One S All-Digital console, Microsoft’s first disc-less Xbox, is reportedly getting unveiled this week. German site Winfuture said that the console is already in the database at some retailers, and leaked an early image of the box and the console itself. 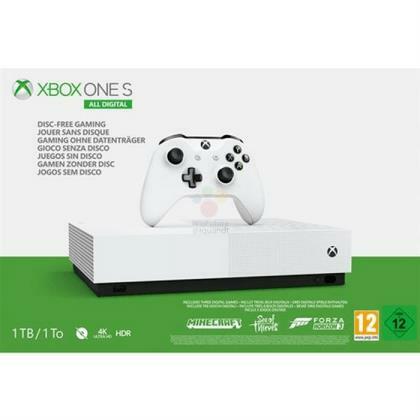 The Xbox One S All-Digital looks almost identical to the Xbox One S, and comes with a 1TB hard drive. It also comes with three games pre-loaded, those being Sea of Thieves, Forza Horizon 3, and Minecraft. Winfuture notes the console will retail for €229, which is around $260. The price certainly doesn’t make much sense, especially since you can already find plenty of bundles under or around $260. It’s possible the US price may end up being $200, given how more expensive consoles generally are in the EU. In any case, the site believes the Xbox One S All-Digital will be officially unveiled tomorrow, April 16. Microsoft’s latest Inside Xbox showcase is scheduled for tomorrow, with a focus on E3 and FanFest. The stream would be a prime spot for that reveal. The console may also end up adopting a different name than the clunky ‘All-Digital’ moniker, such as Xbox One M.
Initial reports suggested that it’ll launch sometime in May, with pre-orders going live this month. Beyond that, a digital-only console would also perfect for the company’s rumoured Xbox Game Pass Ultimate, which bundles both Gold, and Game Pass. The post Xbox One S All-Digital getting unveiled this week, out next month – report appeared first on VG247.